Mazda: plenty of Zoom Zoom | What Car? It's a car that you'll probably never be able to buy, but boy, is it exciting. 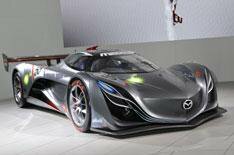 The Furai concept car is based around the Courage C65 racing chassis that competes in America. The two-seater is powered by a 450bhp triple-rotor rotary engine that will run on bioethanol or synthetic alcohols. Aerodynamic features such as a front air-splitter, rear diffuser and special headlamp trims create downforce that stick the car to the road, while the car's sculpted bodywork helps achieve a top speed of 180mph. As you drool over it, though, take heart - the Furai is also said to incorporate some of the styling that will appear on future Mazda models. Latest models from Mazda's line-up will also be on display, including the face-lifted RX-8 that is scheduled to go on sale in the UK next year. The car's body has been strengthened to enhance performance, while improved suspension, driveshafts and differentials improve the RX-8's handling and acceleration. Engine choice is limited to either a 230bhp 1.3-litre model fitted with a six-speed manual gearbox or a 210bhp 1.3-litre engine linked to a six-speed semi-automatic gearbox. Revised front and rear bumpers, remodelled headlamps and larger exhaust pipes are the biggest changes to the styling. The wheels also have a unique five-spoke design, evoking the layout of the rotary engine for which the firm is famed. The clever rear-hinged rear doors remain, enabling the RX-8 to carry four adults. Also shown in Britain for the first time is the Mazda 2 three-door and the BT50 pick-up. Meanwhile, if you fancy something more active, get along to Mazda's Zoom Zoom Challenge, where you can drive a MX-5 and 2 supermini on a purpose-built track. The Challenge involves car control and a series of tests of skill, rather than outright speed. Each participant will get a familiarisation lap as a passenger, driven by a professional racing driver, then a warm-up circuit before their timed lap. The prize is a year's loan of a Mazda 2 1.5 Sport.